Don’t know what to do Friday night? Bored of just going to the bars or sitting at home watching tv? 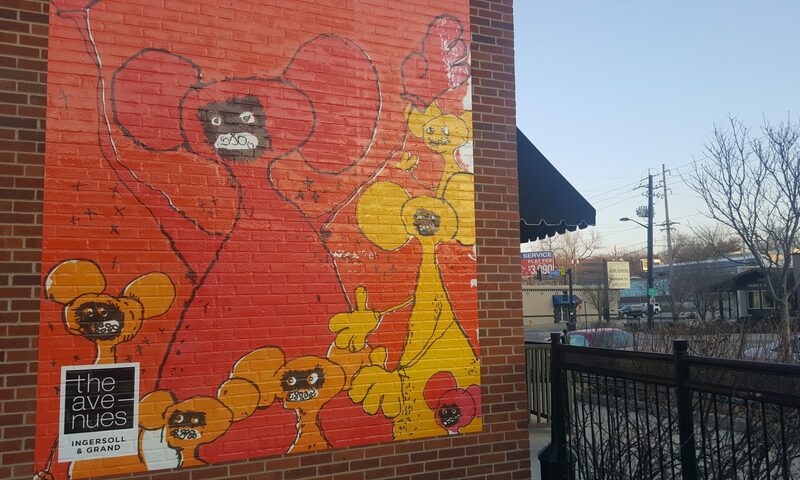 There’s a place where you can enjoy some libations and let out your creative side. 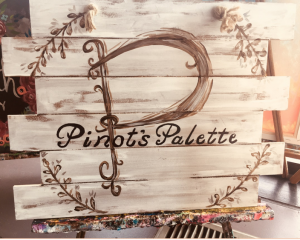 Pinot’s Palette is a paint and sip studio that can be a great time for anyone and everyone! 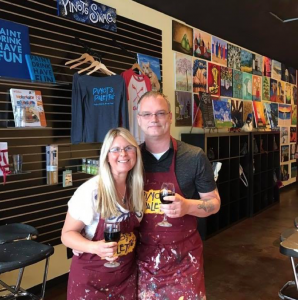 Here’s 5 reasons to come party at Pinot’s Palette! Pinot’s Palette is so much about having fun, its in their motto. From the awesome selection of paintings, to the upbeat and enthusiastic instructors teaching the classes, it’s a party! The Des Moines studio is also BYOB so you can bring your favorite beverage of choice to sip on during the class. The studio is across the street from The Cheese Shop and La Mie Bakery if you want to bring food along as well. The studio is in the process of getting their licensure to serve beer and wine in the future says owner, Sarah Murdock. Although the paintings available are amazing and beautiful, the options to personalize your unique painting are endless. They have a whole smorgasbord or paint colors to choose from. It’s like a salad bar of paint! 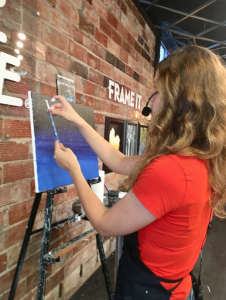 The instructors can even help you out if you want to change up a part of a painting. Literally anyone can do a painting at Pinot’s Palette. Some paintings may seem more difficult than others, but the instructors are so good at explaining and showing the steps that even someone who hasn’t done art since kindergarten can keep up! They are always willing to help you out. This place is great for private parties! “ We’ve had many bachelorette parties, kid’s birthday parties and even a very fun fraternity host a mother/son party”, says Murdock. The front room fits 40 people, and the backroom seats 16, so any size can be accommodated. It’s all private and all fun! You even get to pick which painting your group wants to paint. There is a huge library of paintings to choose from on the Pinot’s Palette website. At the end of the class, you will have a wonderful new painting that you made yourself. It can be a new piece that hangs in your home, or a gift for a loved one! Pinot’s Palette also sells frames and accessories for artwork to make it legit and awesome. 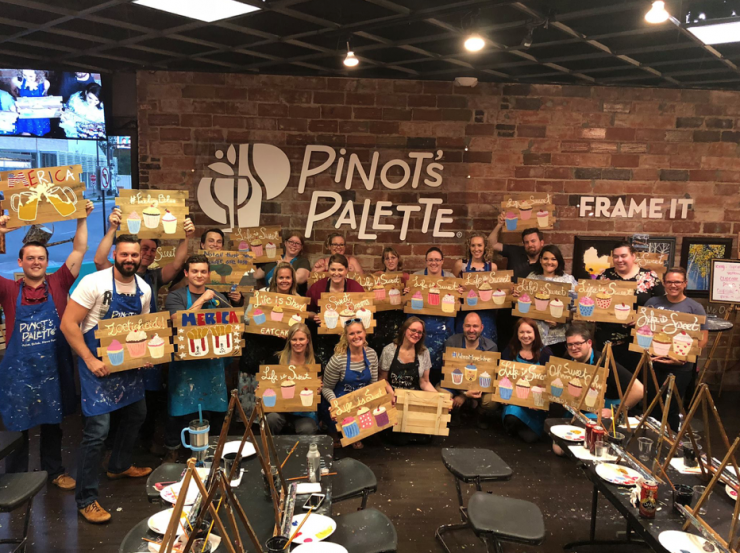 Check out Pinot’s Palette Des Moines’ class calendar for their upcoming events, or head to the Facebook page to check out pictures of previous events or to get in touch with the studio!